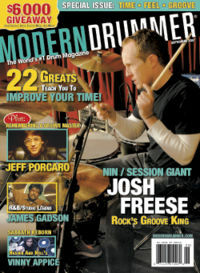 Josh Freese (born December 25, 1972) is a session musician with a prolific career. He was a welcome addition to Nine Inch Nails, replacing Jerome Dillon and Alex Carapetis. Freese was born in Orlando, Florida, and moved to southern California as a child. At the age of 5 he began playing the drums. By the time he was 12, he was playing in the band at Disneyland in Anaheim, California. He started playing professionally at the age of 15. Freese came into Nine Inch Nails in September of 2005, when then-drummer Dillon announced he needed some time off to tend to a personal health matter. Freese played three shows with the band before departing to focus on other projects. By the end of NIN's Fall 2005 tour, Freese was available and became the official drummer. On October 8, 2008, Freese announced that the second North American leg of the Lights In The Sky Tour would be his last with NIN. Freese currently lives in southern California with his wife and four children. This page was last modified on 20 May 2013, at 20:29. This page has been accessed 110,703 times.